Yamaha generators are packed with revolutionary technology; exhibiting enhanced high-power and performance, with superior durability and reliability. In fact, Yamaha brand generators boast the longest engine durability ratings that can be issued by the Environmental Protection Agency, and that is still the case with the EF2000iSv2. 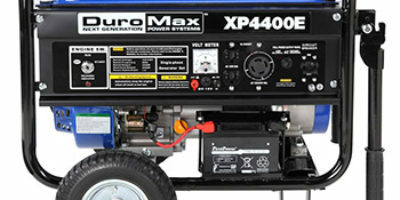 This inverter type of generator provides high-quality energy that can be used safely with the most delicate devices such as a personal computer with a built-in microprocessor. It also consumes low amounts of fuel and is compact. The Yamaha EF2000iSv2 portable inverter generator review will have a deep look at this popular top-rated inverter generator model. Yamaha Motor group, for over 50 years of high performance and concentrated technology aimed to create diverse valuable products and services since its founding. Empowered by a passion for high quality and innovation. Making use of their small engine manufacturing technology, they manufacture products that support everyday life, such as the portable generators. 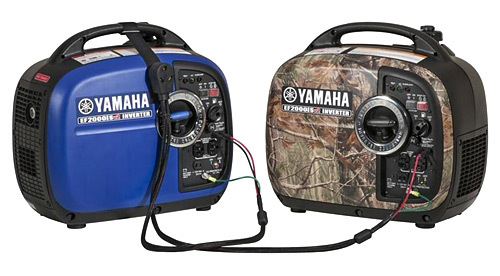 Because of their small size, a Yamaha generator works very successfully in leisure applications such as camping, tailgating, hunting, fishing, and outdoor play. In addition to their use for powering critical home appliances in emergency situations. They work even more comfortable if connected to the electrical output of a car. Quietly powering a wide range of applications for an extended time, while still being portable. Owing to their stable power generation and silent design, Yamaha generators are ideal for a variety of uses. Yamaha EF2000iSv2 inverter generator has 1600W running, peaking at 2000W starting. Has an air cooled single cylinder 4-stroke durable engine with excellent heat isolation. A one gallon gas tank equipped with a fuel gauge; allow this machine to run for 10.5 hours at quarter load. The EF2000iSv2 has a Smart Throttle feature that varies the engine speed according to the acquired load, using a load sensing RPM mechanism; resulting in fuel-efficiency and quiet performance. A quiet muffler allows for super quiet operation 51.5 decibels when running at quarter load and 61 decibels at full load. It’s one of the quietest generators around. It also has a pure sine wave inverter system with Pulse Width Modulation, stabilizing the voltage within ± 1%, and frequency stability at ± 0.1 HZ. It’s a very clean stable power that can be used with sensitive electronic devices such as DSLR cameras or mobile devices. At 44 pounds, it is lightweight and very compact, therefore easy to store and move around. Comfortable handle and rubber absorbing vibration feet add to the smooth operation and noise reduction. The Yamaha V2 has a completely new advanced controller system, resulting in improved output accessibility, giving you the ability to power a wider range of appliances than the previous model. It’s also parallel capable letting you connect two units to deliver double the power. It can also be connected in parallel with the earlier model Yamaha EF2000iS. Equipped with multiple useful features such as the Oil Watch warning system and the gasoline petcock. Starting up this machine is also easy with auto-decompression and auto warm-up system. In addition to the automatic circuit breaker outlets with easy access control panel. Includes two 120V AC outlets and one 12V DC Outlet. USFS-approved spark arrestor and CARB-compliant. The Yamaha EF2000iSv2 lacks an LCD display for effective tracking of the power, watts, and amps being used. You can, however, purchase it at an extra cost as an accessory. It doesn’t provide enough electricity to power heavy-duty appliances, it won’t start up a 13,000BTU air condition that you may have in your RV, nor will it power your heavy-duty electric saw in the construction site. There were few complaints about the unit burning too much oil. Yes, it may be a durable generator but it’s a bit too expensive. To sum it up, the EF2000iSv2 is a great inverter generator, that not only guarantee high-level performance in the various functions you hope for but also makes an outstanding example in functionality, economy, and durability. Its optimal design is capable of powering few of your critical appliances in a power outage, but ultimately it’s ideal power for camping, hunting, and tailgating. It may not be able to power heavy-duty appliances, however, its parallel capable; giving you the opportunity to expand your power by connecting it to another unit. Not to mention the new advanced panel incorporated in this version 2 of the Yamaha EF2000iSV2. It maximizes the AC output power for a longer period of time, runs for up to 13 minutes at maximum rated load before the overload circuit drops down. Resulting in an improved output power, giving it the ability to power a wider range of applications such as freezers and refrigerators. It’s a bit pricey but Yamaha generators create great quality electric power, offering convenience, and reliability. In addition to the 3 years warranty, that also shows the manufacturer’s trust in their product. Other than the Yamaha’s EF2000iSv2, the Yamaha inverter generator series also comes in a variety of sizes. Whether you want to charge your equipment at camp or power your RV air conditioner. Whether you want to find a convenient machine to run your power tools at the job site or want to power your critical appliances in a power outage, Yamaha generators got you covered. EF1000iS, has 1000 watts starting and 900 watts running. EF2000iSHV2, has 2000 watts starting and 1600 watts running (with camouflage design). EF2400iSHC, has 2400 watts starting and 2000 watts running. EF3000iS, has 3000 watts starting and 2800 watts running. EF3000iSEB, has 3000 watts starting (with extra 500 watts boost) and 2800 watts running. EF4500iSE, has 4500 watts starting and 4000 watts running. EF6300iSDE, has 6300 watts starting and 5500 watts running. Finally, with Yamaha’s pursuit of excellence and with their high performance and reliable engines comes this great new model. The Yamaha EF2000iSv2 portable inverter generator review covered all features and aspects of this feature packed portable generator. Lastly, we tried to make the review as clear and easy to read as possible to give our reader a complete idea about this machine. In addition to giving a brief look at the Yamaha inverters family. Yamaha EF2000iSv2 inverter generator, feature packed, fuel-efficient generator, yet compact, ideal for recreational outdoor use.